The real estate market in Slovakia was fully liberalized in May 2014, when the transition period negotiated between Slovakia and the European Union ended (European law requires EU member states not to restrict acquisitions of real property by nationals of other member states, however during EU accession negotiations the Slovak Republic negotiated from this rule the temporary exemption concerning agricultural and forest land). no new rules were introduced with respect of the transferee of forests; therefore, foreign nationals and companies are able to directly acquire forests in Slovakia. All real estates located in Slovakia are registered in the Real Estate Registry and pursuant to the Cadastral Act, information registered in the Real Estate Registry is deemed reliable and binding unless the contrary is proved. 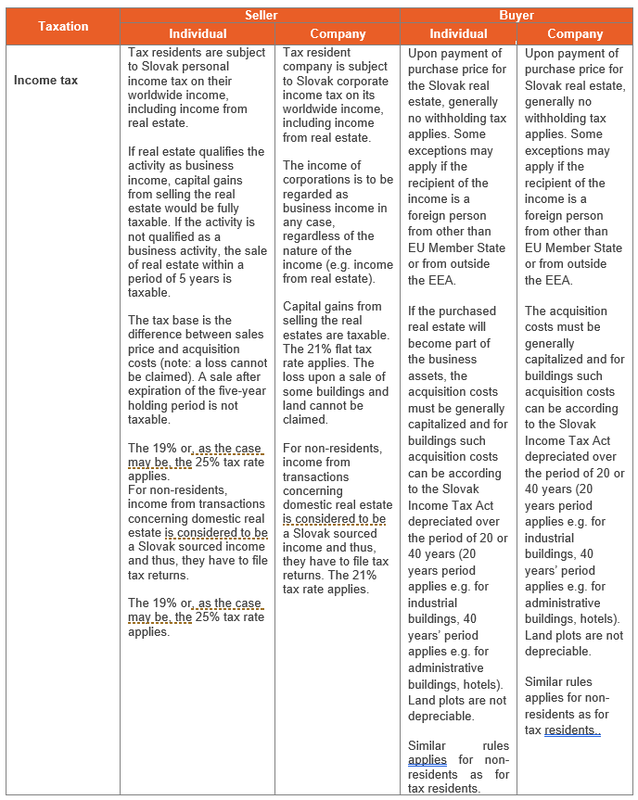 Real estate is evidenced on the respective Ownership Certificate, which includes the following information: (i) information on real property; (ii) information on the owners and eventual co-ownership shares; and (iii) information on any encumbrances, pledges, easements and other rights of third persons to the real property. On the website katasterportal.sk (available also in English language), free of charge, however, this extract cannot be used for legal acts. This online registry is updated on weekly basis. registration of the title in the Real Estate Registry. The ownership of the real estate may be transferred by written purchase agreement concluded under the Slovak law. The demonstration of will to transfer the real estate of both the transferor and the transferee must be on the same document and the signature of the transferor shall be verified. The purchase agreement can be drafted by either party and it does not need to be drafted by a public notary or certified attorney. The purchase agreement must include all the particulars required by the Civil Code and must also comply with the requirements of the Cadastral Act specifying more precisely its content. The purchase agreement must be in Slovak language (or Czech language). Any other language version must be translated into Slovak by a certified translator, making it eligible to be registered in the Real Estate Registry. Prior to the execution of the purchase agreement, the parties may conclude a preliminary agreement in which they undertake to enter a purchase agreement within the agreed time period. Based on the preliminary agreement, either party can sue for the performance of the purchase agreement if the other party breaches the obligation to enter in the purchase agreement. The title to real estate is acquired by the registration in the Real Estate Registry upon the Resolution of the competent Real Estate Administration. The registration process starts by the submission of the Application to the respective Real Estate Administrator and should be completed by the Resolution of the Real Estate Administration. 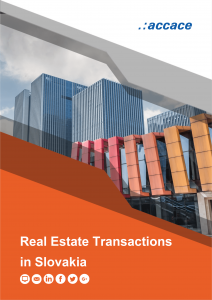 Purchase price can be deposited on escrow account administrated by a bank for the benefit of the transferor, and the purchase price will be paid to the transferor once the respective Resolution of the Real Estate Administration is issued. 3. Application is submitted to the respective Real Estate Administration. The Administration decides on the Application for the registration of the ownership title within 30 days, the fee is in the amount of EUR 66. The parties of the agreement can apply for registration in accelerated proceedings, in this case, the fee is in the amount of EUR 266 and the registration is completed within 15 days. persons related to the owner (in case that the owner is a natural person). always for a price that is not lower than the price published in the Offer. The fulfilment of these conditions must be confirmed by the respective District Authority, otherwise the transfer will not be registered in the Real Estate Registry (and thus, the ownership will not be transferred). It is prohibited to tillage the (i) agricultural land under the area smaller than 2 000 m2 and (ii) forest land under the area smaller than 5 000 m2. 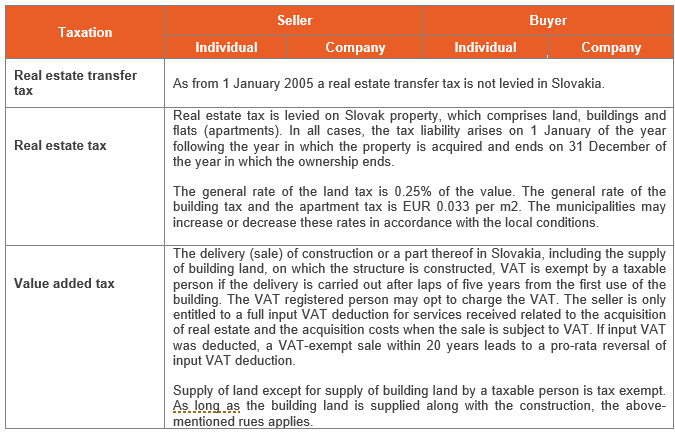 The table below provides a brief overview of fees and taxation with respect to the real estate transfer in Slovakia. Ownership of a land does not include ownership of a building located on it. Slovak law does not recognize the principle according to which the ownership of a land includes the ownership of a building located on it. Consequently, the owner of a land may be different form the owners of the buildings on it. The real property ownership is registered in the Real Estate Registry. A Resolution of the respective Real Estate Administration approving an entry in the Real Estate Registry and the registration of the transfer in the Real Estate Registry may not be considered as a guarantee that the ownership title was validly transferred, as there are several circumstances under which the transfer was in compliance with law.